For additional details see the above book, which covers all Allied designations for Japanese Navy/Army aircraft of WWII. Each aircraft is presented alphabetically according to its code name, and is also cross-referenced to its official (long) designations and project (short) designations. The Carriers of the Japanese Imperial Navy, also known as Kido Butai, were grouped into the 1st Air Fleet (in Japanese 第一航空艦隊 Dai-ichi KōKū Kantai). This unit was the best operative unit of the fleet and consisted of the 1st Carrier Division, 2nd Carrier Division, 3rd Carrier Division and 4th Carrier Division and 5th Carrier Division. 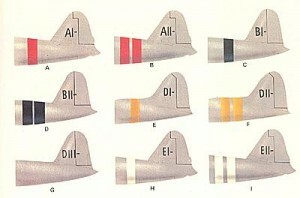 Color Markings of the carrier based Japanese aircraft. 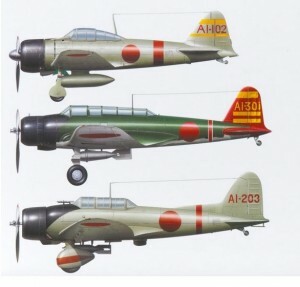 The Mitsubishi A6M Zero of the navy had a color and symbol code to distinguish to the carrier membership. They have some colored stripes in the fuselage to determine the carrier unit. In addition, they have horizontal lines in the tail, which were markings to denote command line. The Akagi fighter, bomber and torpedo squadrons color marks. In the picture shown above, there are there planes: Mitsubishi A6M2, Nakajima B5N1-2 & Aichi D3A1 belonging to IJN Akagi. The letters A/B/C/D/E indicate which Carrier Division a plane belongs too. Then, the next I/II/III roman digits indicate the ship from that particular Carrier Division. Finally, the last three digit numbers are the identification of the plane in its class. See the above picture and consider the case of the zero AI-102. Here the A means the plane belongs to the Carrier Division 1. Then, the second letter, “I” indicates that the plane belongs to the first carrier in that division (Akagi carrier). Next, the digit 1 shows that the plane is a fighter. In the other two planes shown in Figure, the numbers are 2 and 3 because they are bomber and torpedo bomber respectively. Finally, the last 2 digits are the aircraft’s individual number inside that class. In addition, the command position/rank was indicated in the tail Markings with horizontal lines as follows: one Stripe indicated Flight Leader (section commander), two Stripes indicated Squadron Leader and three Stripes shows a Group Leader. The Section Commander was also known in Japanese as Shotai and included 3-4 aircraft. The Squadron Commander is also known as Daitai in Japanese and includes 15-27 aircrafts. The Group Leader or Commander also known as Hikotai consisted of 40-50 Aircraft for IJA air force. In case of IJN, it consisted of every aircraft onboard carrier, a high hierarchical level. Finally, we also had a four stripes mark which were used for large scale aircraft units such as campaign commander. This is also referred as Kokutai in Japanese.